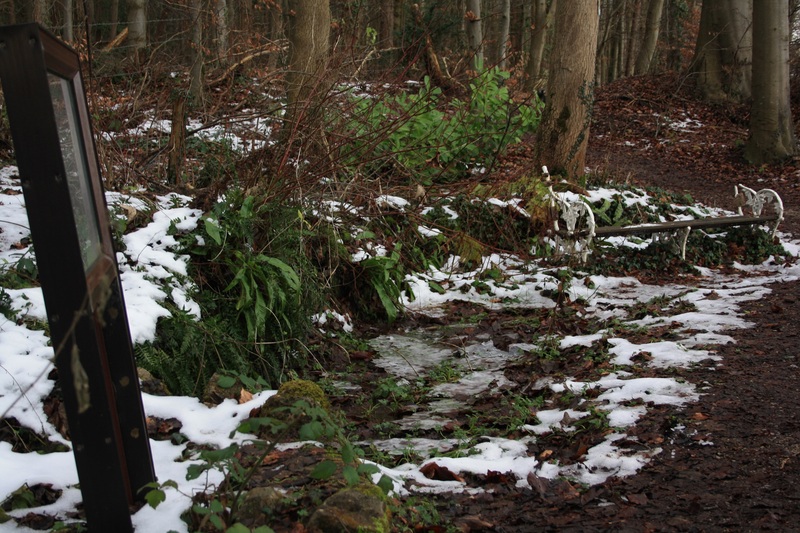 We launch into 2015 with an oddity, a well that failed to cure. 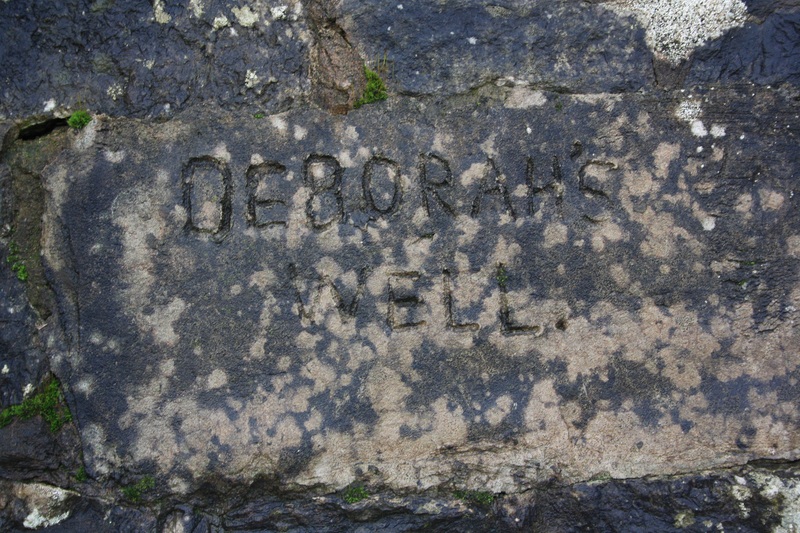 Deborah’s Well lies by the side of the road to Cadole from Gwernaffield, just to the west of Mold. The only account of its history that I have found anywhere dates from the 1980s and was written by local historian, the late Councillor Arthur Smith. That the name of Deborah has some historical association with the area is undoubted. The woodland close to the well site is known as Deborah’s Wood and a field opposite also carries her name. 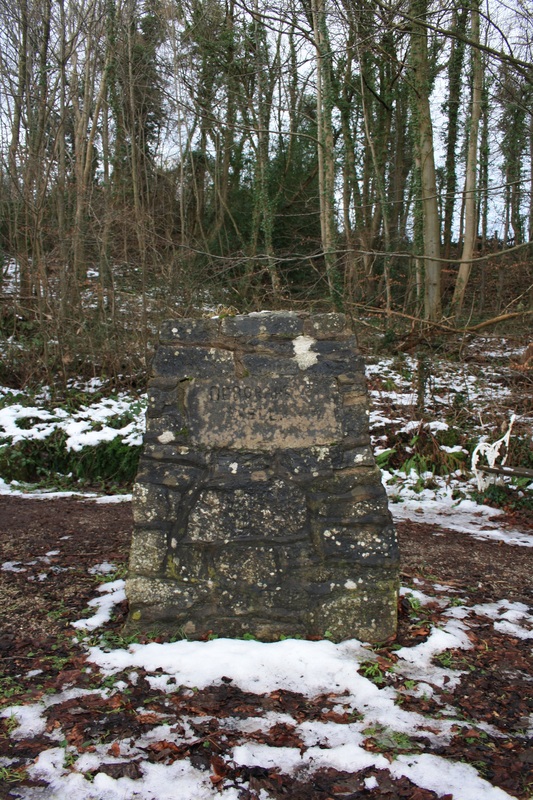 A lead mine seam, dug in the late nineteenth century is marked on contemporary maps as the Deborah seam. However, no well, named or unnamed, appears on any of the OS maps back to the 1870s. 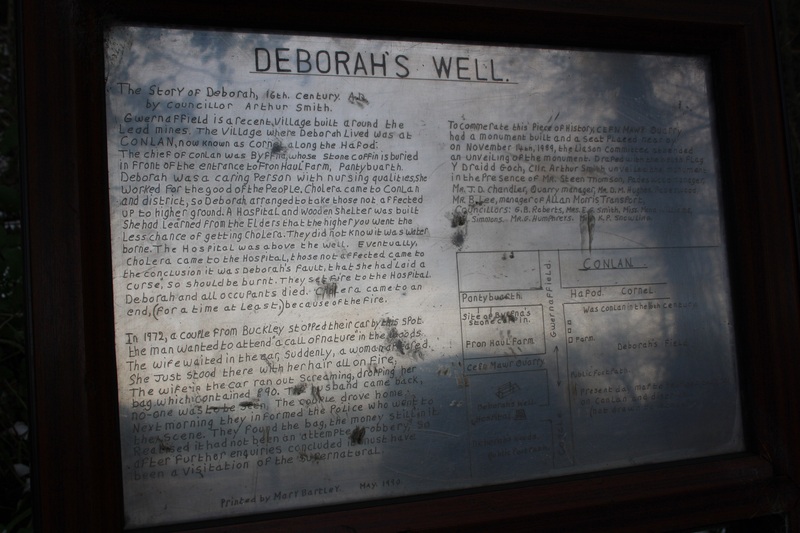 Cllr Smith’s account of the history of the well, first written in a local history magazine, is engraved on a metal plaque mounted beside the well. It tells of an outbreak of cholera in the area. Deborah led the healthy residents into the hills above the village in hopes of avoiding the disease. She established a hospital in the woods above the well as a refuge from the outbreak. However, despite her precautions cholera reached her hospital and the villagers died. Survivors then concluded that the spread of the disease was not a natural inevitability but rather a direct result of Deborah’s actions and concluded that she must be a witch and responsible for the deaths. They burned down the hospital with her inside. We find some obvious holes and inconsistencies in the story. The account on the plaque beside the well sets the story in the 16th century although a retelling in a local history pamphlet adjusts the date to the 6th century. Both accounts in passing refer to a local chieftain, Byffna, supposedly buried in a stone cyst close to the site, although they fail to mention whether or not the story of Deborah is linked to Byffna. Clearly the survival of a story in local folklore from the 6th century may be harder to credit than one from the 16th century and perhaps the possibility of it being a much later invention to explain the naming of local landmarks increases. In addition, whichever date is chosen, we must note that cholera did not appear in the UK until much later and could not have been the disease Deborah sought to avoid. Clearly in a story passed down through successive generations these specific details may easily mutate in response to current attitudes and fears. The site we see today includes the plaque bearing Cllr Smith’s account and a stone monument with the name of the well. The well itself is enclosed on three sides by a low stone wall. The whole site was constructed in 1989 as a gift to the village by the local quarry company on the instigation of Cllr Smith, and was unveiled then with much ceremony. I do not know what, if anything occupied the site prior to this time. A final story of the site, again from Cllr Smith’s account, tells of an event late one night in 1972. A couple were driving home stopped close to the site. A woman, with flames leaping from her hair ran from the woods. The couple fled, but when they returned the next day, no evidence or accounts of injury could be found. This we must assume was the spirit of Deborah, seen fleeing from her burning hospital.